A smelly hockey bag can hold a lot more than just your equipment! Recent reports in the news have alerted us to the occurrence of severe, sometimes fatal infections caused by a strain of the bacteria Staphylococcus aureus, Methicillin-resistant Staph. Aureus (MRSA). 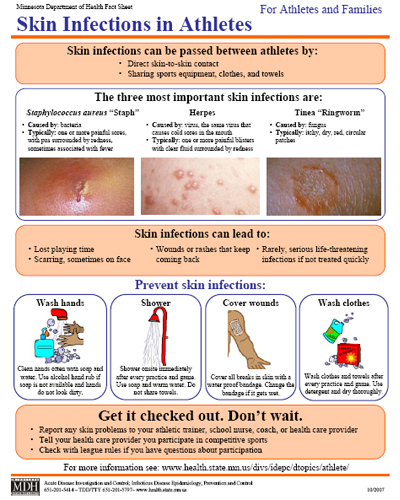 This article is a brief introduction to the problem, and a guide to reducing the risk of contracting this potentially devastating infection. Staphylococcus (Staph) is an ubiquitous human bacteria. Benign strains of Staph are present on the skin of all humans, and the majority of strains of Staph are benign. More virulent strains can arise due to the development of resistance to antibiotics; MRSA is one such strain. The overuse of antibiotics, such as for common ear infections in children, have propelled many otherwise-benign strains of Staph and other bacterial families to develop resistance to antibiotics. Infections caused by resistant strains are more difficult to control and eradicate. Most of the serious infections and fatalities associated with MRSA occur in sick or debilitated patients in the hospital. However, the recent alarm is due to cases of MRSA-related fatalities in otherwise healthy young people. The Centers for Disease Control estimate that 1 in 7 deaths due to MRSA in 2007 have occurred in healthy, non-hospitalized patients. Serious and fatal infections occur when MRSA gains access to the soft tissues beneath the skin, where it can proliferate and reach the bloodstream and vital organs like the heart, lung, and kidneys. 1. WASH YOUR HANDS: Everyone should wash their hands several times a day. Ideally, hockey players and coaches should, at minimum, wash their hands right after coming off the ice. Scrubbing 30 seconds with warm water and soap, taking care to scrub between the fingers and under the nails is adequate; alcohol-based hand sanitizers may be more convenient in a crowded locker room. Lingering in wet equipment with a layer of salt on the skin poses a risk for abrasions and infection, so players should shower as soon after practice as possible. 2. PREVENT CUTS: Hockey players are subject to many sharp edges, so care should be taken to prevent cuts and bruises. Skate guards should be on the skates before they are placed in the hockey bag. Hard plastic equipment such as helmets and shin guards should be repaired or replaced if they contain sharp edges or have screws that protrude from the surface. Proper-fitting equipment is less likely to rub or abrade the skin. 3. TREAT CUTS: Minor scrapes and deeper cuts should be attended to immediately. They should be washed for 30 seconds with warm soap and water and covered with a clean, dry bandage. Deeper cuts should be scrubbed with an approved disinfectant solution, taking care to rub and rinse the cut edges of the skin to remove any dirt. A topical antibiotic ointment (Neosporin-polymyxin B) should be applied to more serious cuts when the wound is dry. The bandage should be changed 1-2 times a day, and should be replaced immediately after practice or a game. A doctor should be contacted at the first sign of an infection (redness, swelling, oozing yellowish fluid). 4. DON”T SHARE: Equipment and used/soiled clothing are an excellent breeding ground for bacteria. Players should not share any equipment or garments to limit the risk of infection. 5. IT’S IN THE BAG: Hockey players have a lot of great traits, but fastidiousness is usually not one of them. The smell of a hockey locker room and especially the equipment bag are legendary. Wet equipment left in the airless confines of an equipment bag is an excellent breeding ground for all sorts of bacteria and fungi. Equipment should be dried in a warm, dry area in the house IMMEDIATELY after each use. The tongue of the skates should be reflected forward to increase the air flow inside, and the insides of the shin guards, shoulder pads, and elbow pads should be face up if the equipment is dried on a flat surface (hanging from a line or hook is ideal). Pants are difficult to wash; however, everything else (except the skates, of course) should be machine-washed with soap on a warm cycle and left to air dry every few weeks. Given the frequency of ice time, this may take some advanced planning. The equipment bag should be emptied completely every week or so; remove any trash (including the beloved tape balls) and wipe out the inside of the bag with a mixture of mild detergent and water (avoid strongly-scented cleaners). Allow it to air dry completely. 6. UNIFORMLY GREAT: Socks and jerseys should be washed regularly. Having more than one pair of practice socks and an extra practice jersey should allow for a rotation through the washing machine regularly. Clean undergarments should be worn every time a player hits the ice. Newer materials, such as those found in Underarmour, are better than cotton t-shirts and shorts because they wick sweat away from the body. Additionally, wet cotton can become rough and abrade the skin in a relatively short time.